This is the summed total of all the climbing within a route and is a good indicator of the strenuousness of a route. An estimate of the time taken based on a derivation of Naismiths rules. Our calculation is based on the horizontal and ascent components of a climb, we do not make a reduction for descent. Registered users can customise these walking times by specifying their own walking and ascending speeds. They can also add a fixed time period for stoppages. The horizontal distance of the route. You can click on the map name to purchase the map for £6.29 including postage which is one of the cheapest prices we have found. A brief summary of this route. Our summary will always contain one of easy, moderate or hard to indicate the severity of the route. Here we provide the nearest town to the start of the route where you will find basic services. We then give directions from that location to the route start. Your approach route may differ. From Kenmore at the Eastern end of Loch Tay follow the A827 west towards Killin. After Approximately 12km you reach a bridge crossing the Lawers Burn, just before the bridge a track leads NNW to Machuim Farm and the start of the route. The total ascent is 1,748 metres. Allow 7.5 hours to complete this 20.45 km route. In winter months please check the local snow conditions at sais.gov.uk. The hillphones service can inform you of stalking activities in the area. Usually the shortest way to climb the mountain, making best use of tracks and paths to gain altitude. Route navigation requires map reading skills and an ability to navigate with a compass. The information given here will enable you to annotate your map and plan your route. We do not give anecdotal descriptions on where to find the paths, worn by the feet of previous mountaineers. Where the access routes are few or the ridge is narrow, paths are generally obvious. On open ground, following paths without using your compass may get you lost in poor visibility. A selection of weather forecasts local to this route. 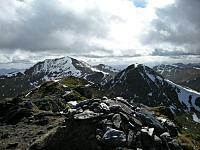 We did not follow the complete circuit, descending after An Stuc down to Lochan nan Cat. 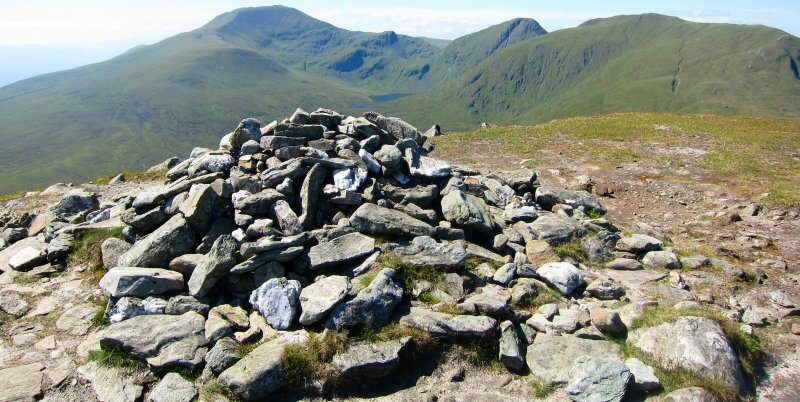 The ascent of the N face of An Stuc was tricky by my standards and I would not have fancied descending the face. Apart from that, it was a long day of grassy slopes and relatively friendly gradients. Watch out for the descent to Lochan nan Cat, which offers no option other than steep grassy slopes and also for the shortage of parking - we had to 'donate' £5 to the RNLI, despite arriving before the crowds. Not a bad route. Low,thick cloud all day but still easy enough to follow. Left the car at the visitor centre and biked to the start point in Lawers village. plenty of safe places to secure them until the return in the car. 5 stars as completed in winter. No real problems. Deciding when to start ascent of Meall Greigh could be interesting in poor visibility although the burn running off it is a good marker (Better shown on 1:25000). 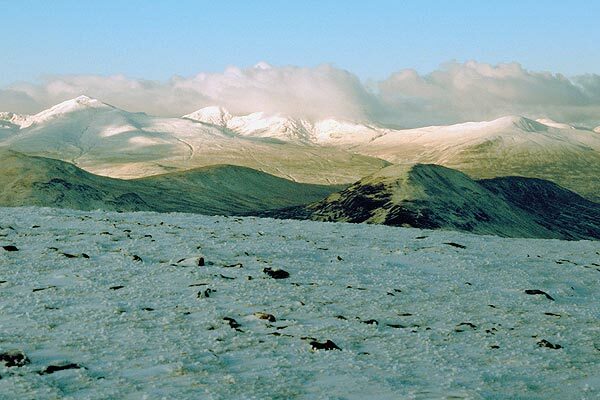 Oh and An Stuc is entertaining,traverse round to the North Face and make your ascent from there (good snow fields to crampon up). I cut this route short by back tracking after reaching Creag an Fhithic, descending from the col between this and An Stuc, to Lochan nan cat down steep grassy slopes (avoiding a few crags). From there, a long boggy walk back to the track you came in on and then back to Machuim farm. 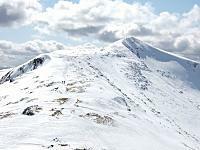 No route finding difficulties, though in winter the track between Meall Greigh and Meall Garbh would be obscured of course. 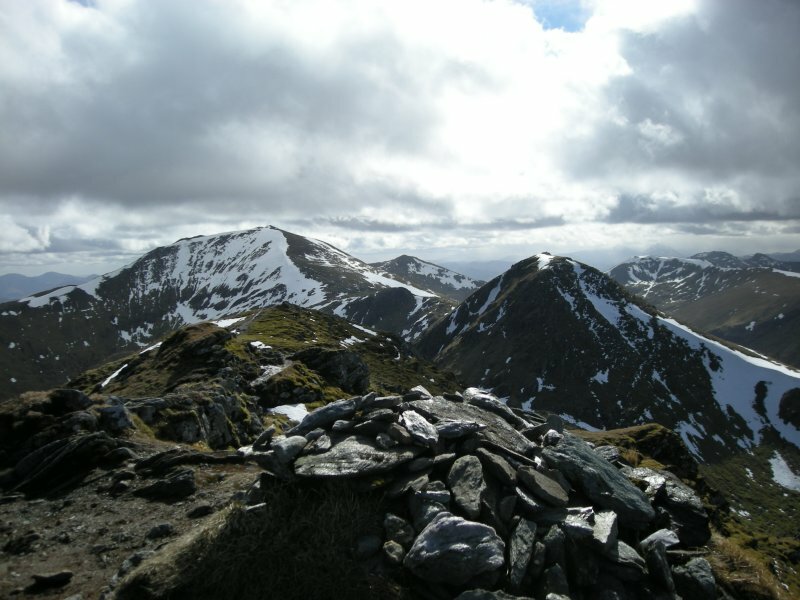 The ascent of An Stuc might not be considered an "easy scramble" in icy conditions. Disclaimer. The details provided above are an aid to planning an expedition, but all distances, altitudes and bearings must be considered approximate. You must navigate with the appropriate map, a compass, your navigation skills and common sense, MunroMagic.com accept no responsibility for your interpretation of our route information.